Picasa, the online web album from Google which is similar to flickr, photobucket etc. but has a separate tool which can be downloaded to your PC and from there you can upload your pictures or photos to the web album of picasa. 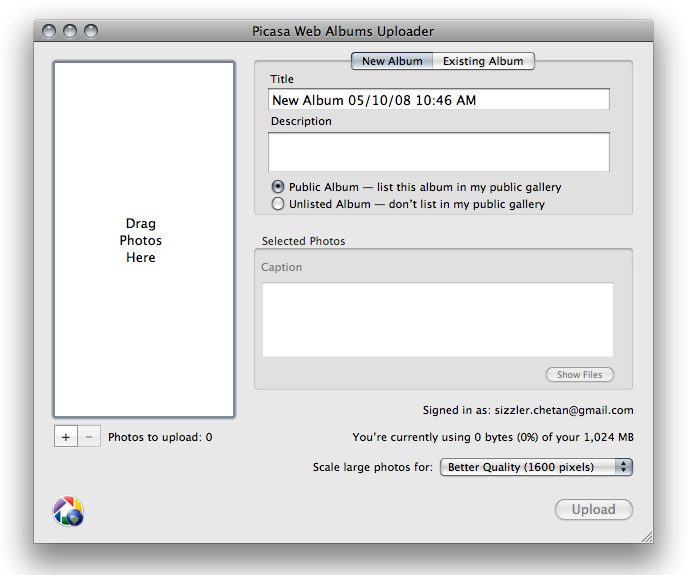 So if you are using an Apple Macbook, or macbook air, then you can download the Picasa web uploader for mac from here. Install the web uploader app in your mac and then open the “Picasa Uploader” which might be there in your applications folder, or you can easily spot it through the spotlight in your mac. Dialog box appears asking you to sign into your picasa account. Login and proceed to next window. Click on the option “New Album” and enter title and description to it. If you want to upload pictures to an existing album, click on “Existing Album”. In the left section, click on + sign and add pictures from the folders in your mac. You can either select the entire folder, or just drag a few pics to that box which you need to upload. Click on Upload when you are done with selection of the pictures to upload. 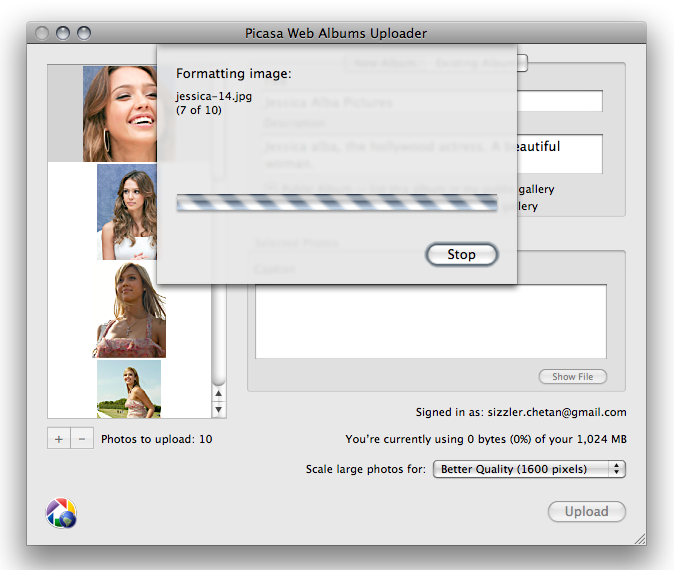 You would see the images being formatted to get ready to upload to the picasa server. After formatting finishes, the uploading process starts and the progress box shows every info about the upload process. When the upload finishes, a dialog box confirms with you whether to open the album or not. And your pictures are uploaded already. You would see them in your picasa profile. Too easy, right? Next, i would be explaining how to place albums and slideshow in wordpress blogs and other websites. This was actually the first time i uploaded pictures to picasa album though the uploader but i knew how to do it. Check the album of Jessica Alba that i created during this tutorial. Your phone has jessica pics and now your albums too have the same, whats the connection? serious fan here? kool find there chetan, this is the easiest way to upload photos into picassa, do u have any such thing for Vista users? ?